Here is a list of all the postings John Privett has made in our forums. Click on a thread name to jump to the thread. No change then for the top 2. John Stones' win today moves him up 5 places to 3rd, and Kev's 3rd place moves him up a place to 4th overall. Iqon and Flyer move down 1 and 3 places respectively to 5th and 6th. Simon drops 4 places today to 10th. Gary's 8 place drop is not a real drop - he has joined the league since Bahrain, so the 8-place drop is just a statistical anomaly - as he didn't have a league position to move from! Charles and John Tee continue at the foot of the table - their apparent 1 place drop each is just a result of Gary joining in 8th place. Up next in 2 weeks is Azerbaijan (did I spell that correctly?) I think my team might need a 'tactical adjustment' before then! Top scorer today is John Stones with 170 points, with Chris 2nd only a point behind! Kev completes the top 3 today with 158 points. well done to all of you. And it's an early start as we're in China with qualifying tomorrow at 7am UK time and the race at 7:10am on Sunday. Many thought Ferrari would have the upper hand again, but Bottas leads the P2 times just ahead of Vettel with Verstappen in third. Channel 4 coverage is around lunchtime on Saturday and 3pm on Sunday, so I'll delay posting the results until after the Ch4 coverage has concluded. I just had a look over in Canada where my daughter is at the moment. The squares there mostly have much longer words! Like calculator and corporations, and a nearby street-corner has purified.backwards.lecturers - not sure if that's appropraite or not for a university city! So, how does it look now in the overall table with two races completed? Robin remains in top place on 326 points. Chris moves up 5 places today to take second on 285 and Flyer moves up 2 places to 3rd on 284. Iqon slips a place to 4th while Kev moves up 1 to 5th. Simon suffers a 4-place drop to 6th and Pete moves up 2 to 7th. 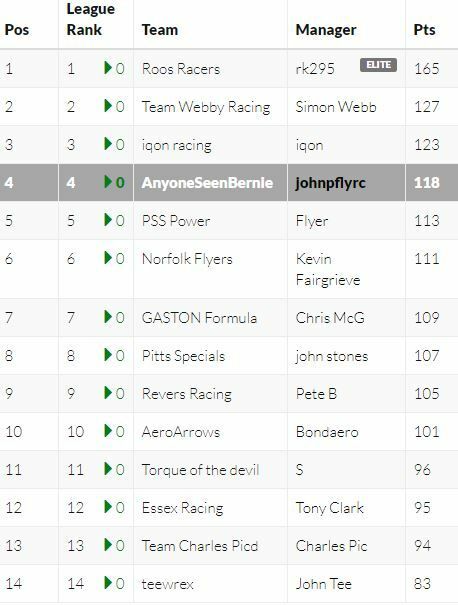 John S Stays put in 8th while I suffer a 5-place drop to 9th. Bondaero, Stu and Tony remain unchanged in 10th, 11th & 12th respectively whilst at the foot of the table John Tee and Charles swap places. Next up is China in 2 weeks, and I guess another early start after the rather civilised timing of today's race! Top scorer today was Chris with 176 points. Only five points behind Chris was Flyer and 3rd place, on 161 points, was Robin - with Pete and Kev snapping at his heels! +ve input is at the top on Colin's ESC, -ve is at the top on Denis's. So they're certainly different. But just a different generation, or something else? But what to predict?... And should we change our teams? The frist two practice sessions appear to show Ferrari in control. Maybe no surprise as the Bahrain circuit is much more like Barcelona than Melbourne was. FP3 is tomorrow at noon followed by qualifying at 3pm UK-time. The race is at 4.10pm UK-time - and don't forget to put the clocks forward on Saturday night. No ban at my club, and very few genuinely radio-related problems. If anything, the most prone to failure radio - for us - seems to be genuine Skektrum. Very few of our club members use it, but if ever there is a radio problem it seems to be with one. kc- I have been a btinternet customer in the past and my family have a number of btinternet email addresses that we continue to use. One day I'll move us all onto other addresses, but for the moment my wife and one of my daughters use their btinternet address and no others. Add an extra col after the end? No! It's my lad John, he joined forum few days ago, and is finding his feet. Excellent - he'll be beating you in no time! Just wondering who "S" is? I recognise all the rest. ok - as a workaround for the moment... Here's a picture of the table! Ignore the highlighting on my entry! Flying start for Robin with Roos Racers, heading our league with 165 points. Well done Robin - in the top 60 globally! Simon scored 127 for 2nd place with Iqon scoring 123 for 3rd. The rest of us trail somewhere behind, and last season's winner seems to be giving us mortals a head-start with his score of 105. It's now just after 4pm and the Channel 4 folks should have reached the end of their coverage, so here is the first set of results for 2019 in the Modelflying Forumites league. Charles, the channel 4 qualifying coverage was due to finish at 1:30pm, so I personally see no problem in discussing it now. Other viewpoints are welcome! But yes, I was also surprised that we just seem to have more or less picked up where we left off last season. Ferrari were said to have the edge, but it doesn't look that way - at least not at Melbourne! The Melbourne circuit is a bit different to Barcelona where all the winter test sessions were held, so who knows how the teams will compare elsewhere. Good to see Lando Norris qualifying 8th in the McLaren, Sainz could also have been in the top 10 if he hadn't been held up in Q1 when Kubica tried to take lumps out of the scenery with his Williams. Alarm clock set for tomorrow morning! Hi Chris - welcome aboard! I had a bit of a near miss - with my predictions... Despite reminding you all to do them, I almost forgot to do mine. Got them done at 5:55 with 5 mins to spare!